Personalized umbrellas branded with your logo are a big hit at any event. We compiled successful ideas for umbrella giveaways for healthcare, finance, hospitality, education, and the great outdoors (think golf outings!). If you are already not familiar, custom umbrellas make a perfect corporate gift. In fact, they are a very underrated gift for the return you receive on your investment. When you consider the cost of an umbrella versus the number of impressions you get, the cost is cheaper than any other form of advertising. But don’t just take our word for it. Take a look at some of the statistics. 45% of consumers in the United States own promotional umbrellas. Those who do own them keep them an average of 14 months, with quality being the number one reason they are kept. They receive an average of 1,100 impressions throughout their lifetime, which costs you approximately one penny per impression (much cheaper than any online advertising). Also take into consideration that 85% of people who receive a promotional item have a favorable opinion of that brand. They are also more likely to do business with a company that gives them a promotional product. Using logo umbrellas is a perfect way to fall within these categories. Keep in mind these are not the only ways to use custom umbrellas to promote your brand. But, they will give you a good idea on how to adapt these marketing ideas to your specific brand. The healthcare industry accounts for some of the largest overall sales of umbrellas. According to Advertising Specialty Institute, it accounted for 8.7% of distributor sales. They are used as promotional items given to doctors and nurses as well as given to employees as gifts. You can also find them at the entrance of most medical facilities for people to help others out to their vehicles when leaving. No matter what way you choose to use engraved umbrellas to promote yourself in the healthcare industry, just note that you will get a great return on your investment for doing so. The above ideas are just the tip of the iceberg. Take a look at your own marketing calendar to figure out the best ways to implement promotional items for your facility. Financial institutions have long used promotional products as a way to entice customers and reward their own employees. If you know anyone in the financial industry, chances are they have a branded promotional product from their company. You may have also seen these items used as rewards for people referring new customers. Just keep in mind that banks and other financial institutions wouldn’t use these items if they didn’t provide some type of return on their investment. Branded umbrellas work well in the financial industry as clients want a higher perceived value. Although umbrellas don’t cost an arm and a leg, they are still seen by clients as something that cost you more than a fidget spinner or refrigerator magnet. Use this to your advantage by offering something that is perceived as a high value item. 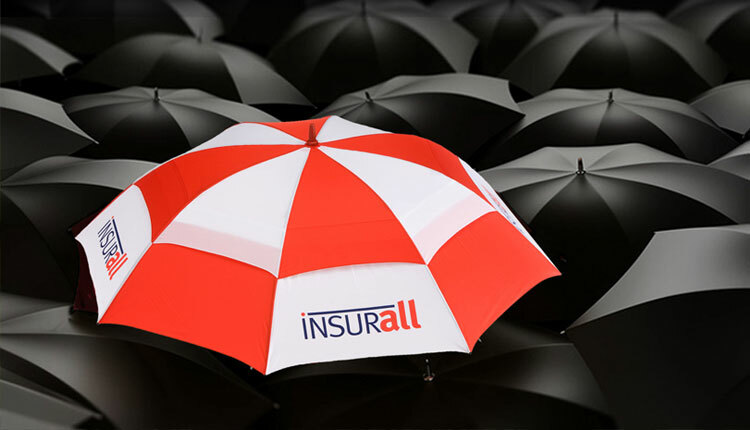 Logo umbrellas can be used in just about any financial institution, including banks and credit unions, brokerage firms, and even insurance companies. Some of the uses include giving to customers who open a new account, giveaway items for sales people, and even for giveaways or drawings at trade shows. Educational intuitions are another place that generate a lot of buzz with promotional items, including engraved umbrellas. High schools, colleges, universities, and even trade schools use them as marketing tools. The best use of custom umbrellas for educational institutions is to order them in a variety of colors and styles. Show off school colors and mascots as everyone will use them at sporting events. You can also use them as a gift to incoming students at orientation for use while walking around campus. Don’t forget about your library or swag store. Keep umbrellas in stock with your college or high school logo. Students will purchase them whenever there is a need. Its kind of like when ice cream is popular in the summertime. Umbrellas will sell out once it starts to rain. In addition to schools using them for promotion, local PTA and booster clubs can do the same. Some other uses could be for gifts to parents or teachers, fundraising items, or gifts to alumni who will be more than happy to share their school colors. Who doesn’t love sports? Well, according to a Gallup poll, there are quite a few people who consider themselves sports fans. Sixty-three percent actually. That are a lot of people who will potentially see your brand which is why so many advertisers choose athletic events for advertising. In fact, children’s athletics alone has turned into a $15 billion industry. Start thinking of Bobbleheads at the ballpark and mini-basketballs at the arena. Only difference here is you are using umbrellas as the tool to advertise. Umbrellas make a great promotional item for any sporting event. From custom golf umbrellas to folding umbrellas for the sidelines of football games, there is an umbrella to fit each type of sport possible. They are great for anyone managing a local sport team, booster club, and even amateur and professional sporting venues. Raffle prizes on day of events. No matter what type of sport organization you run, custom umbrellas have proven to be a perfect marketing tool. Remember, the cost is about a penny per impression which is a great value. Promotional umbrellas are a no-brainer for anyone in the hospitality industry. Hotels and restaurants both have outdoor areas that are frequented by guests. With weather constantly changing, having custom logo umbrellas on the property is necessary. Rain or shine, umbrellas come in handy to keep out the rain as well as shade from the intense heat. The hospitality industry presents plenty of opportunity for brand impressions. According to Statista, the restaurant industry alone reached $745 billion dollars in 2015. This from 19 million people visiting full service and 49 million people visiting quick service restaurants. How about hotels? Well, it is predicted that there will be 96.4 million visitors to hotels by 2020. Think of all those people that would potentially see your brand. In addition to hotels and restaurants, umbrellas are used as promotional tools by resorts, cruise lines, at food courts, and even bed and breakfast locations. Some of the best uses include giving them to guests as a gift, rewarding employees for good work, and selling in a souvenir or gift shop. In the hospitality industry, there are always special events. Why not use umbrellas to promote these events? Umbrellas provide a large advertising space due to their size. Include a logo of the even or even information about the location and date. Give these away in the community where the event will take place and watch as you gain countless impressions. You can choose umbrellas in various sizes, colors, and styles. These include inversion, telescopic, folding, and numerous other types. If you don’t see the style of umbrella you like in our custom umbrella section, reach out to one of our specialists who can match you with the right style for your industry. No matter what industry you are in, there is always a use for promotional umbrellas.